We have a venue that is perfect for your wedding, reception or both. 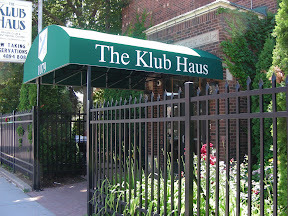 We are the Klub Haus. This is a beautiful historic brownstone that was completely renovated in an old world European style. We know you have a budget, and The Klub Haus is the best choice while still being able to have a beautiful complete venue. We are one of the only venues available that allows outside catering. (dishware, silverware, glassware, tables, chairs, & linens) with no additional rental or tax charge. Our facility consists of a full catering kitchen with full beverage and liquor service with 2 full bars and a soft lounge. Our private club liquor license requires us to provide all beverages. We do not have minimums or requirements and our club prices are very reasonable. We will operate the bar anyway you desire based on your budget. Our dining hall has a capacity of 200+ seated. We have custom hand built beautiful oak tables, a solid copper ceiling, audio & video capability, additional lounge seating, decorated beautifully including original art. Our spacious activity center/ballroom upstairs has a birds eye maple hardwood floor, with custom adjustable lighting, a professional audio system, and a full bar. 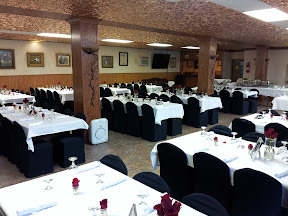 The ballroom can accommodate all of your guests. It has a full raised stage with a sound system and mixer, (saving you the cost of DJ or live music if you prefer) theater lighting, a beautiful velvet stage curtain, a fully plumbed side dressing room, and a separate coat room. In addition, we have a 2000+ square foot outside brick patio with award winning gardens. It is a wonderful spot to have your ceremony or reception from summer through fall at NO ADDITIONAL CHARGE. Our food and beverage license apply to the patio and you can seat 150 outside. Although the patio is handicap accessible, the building is not. We have on-site parking (25 spaces including handicapped) local off street lots (80 additional spaces) and 100 on street. We pride ourselves in being service oriented and catering to the individual needs of each event. We offer many additional needs as required, along with recommendations for proven "Vendors." Please look at our "Money Saving Ideas" and our "About Us" page on this website. I would like to speak to you personally, and request that you call me directly to answer any additional questions. You can request additional information directly from us.